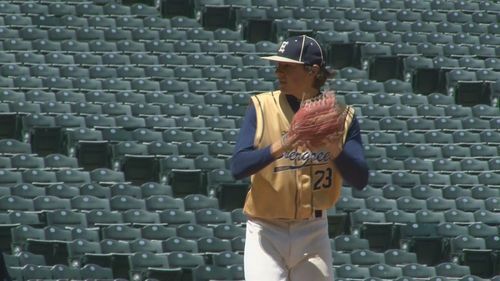 Evergreen's Brock Burke delivers a pitch at Coors Field. Evergreen LHP Brock Burke was drafted by Tampa Bay in the 3rd round of the MLB draft. The Tampa Bay Rays selected Evergreen LHP Brock Burke in the 3rd round of Major League Baseball's amateur draft. Burke was the 96th pick overall. "I talked to the Rays about 2 hours before and they said make sure you watch the 96th pick," Burke told 9NEWS. As far as that 2 hour wait: "It sucked. It was horrible," said Burke laughing. Burke had a 1.56 ERA in his senior season with Evergreen. He faced 165 batters and struck out 90 of them. 19 of those strike outs came in one memorable performance at Coors Field where Burke led the Cougars to a 4-0 win over Eaglecrest. Brock was at home watching the draft his family when his name was called. "It's good to see the hard work pay off, it's a great experience," said Burke. He is the first Colorado high school player taken in this year's draft. "It's really awesome thinking I'm the top prospect in Colorado," he said. "For the Rays to think that highly of me is awesome". Burke hits 89-93 MPH with his fastball and also throws a slider, curveball and a changeup. He is committed to play college baseball at Oregon but as of now says he is definitely leaning towards signing with Tampa Bay and starting his professional career. The next Colorado high school player to come off the board was Regis Jesuit's Max George. The Raiders short stop was taken by the Colorado Rockies in the 6th round. George hit .458 for Regis this year and was named Colorado's Gatorade player of the year. He is committed to Oregon State to play baseball.